The Real Thing PRO-Probiotic Capsules contain 20-billion colony forming units of 10 probiotic bacteria and yeast per dose, plus two of their favourite prebiotic fuels for growth. It all adds up to better digestion and increased immunity. Do the math. 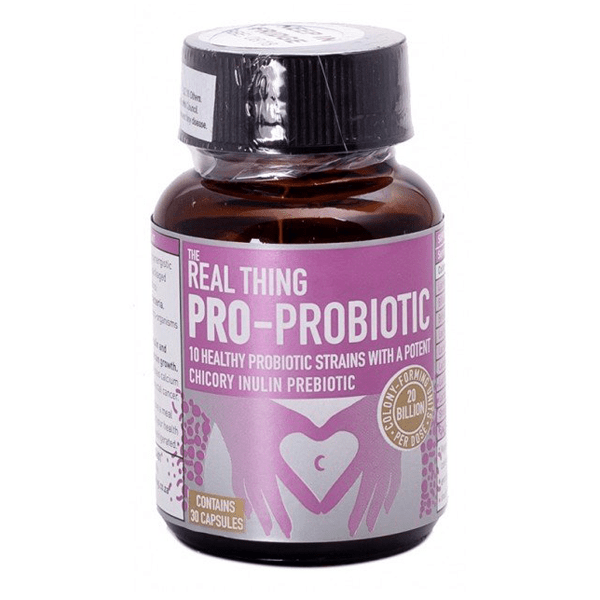 The Real Thing PRO-Probiotic is a synbiotic that contains nine strains of healthy bacteria and a probiotic yeast. More specifically it contains 20-billion colony forming units per dose ? about 20 times more than the average probiotic. Stress, prescription drugs, alcohol, a high-fat diet, too much red meat and too little dietary fibre can allow bad gut bacteria to overgrow and take over the gut. This can lead to digestive problems like infections, lactose intolerance, diarrhoea, irritable bowel syndrome, Candida and reduced absorption of nutrients. Unless you put more good guys in – that’s why PRO-Probiotic can be your saving grace. Adults over 18 years of age: 1 capsule daily, unless under the supervision of a medical practitioner. Antibiotics can reduce the efficacy of probiotics, therefore take the probiotics at least 2 hours before or after antibiotics. To maintain viability, store in a refrigerator and use before the expiry date. Supplementation should not replace a healthy, balanced and varied diet. Speak to your doctor or pharmacist before taking any supplement.